There was a brief time when the toy company Worlds of Wonder seemed like a truly magical place, a Willie Wonka-inspired (just check out those initials) toy factory that produced state of the art playthings that looked for all the world like minor miracles. 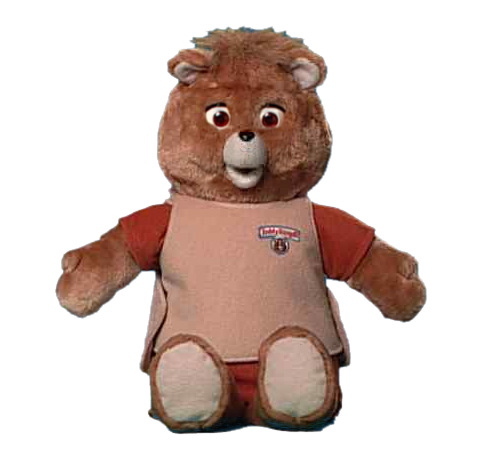 Teddy Ruxpin “changed everything,” as they say. Finally, children could have a teddy bear that talked to them instead of just laying around in a heap most of the time. You could easily imagine Worlds of Wonder producing new and better toys year after year until by 2000 every child with the means would have their very own life-sized C3PO to boss around. It kind of didn’t work out that way (the company folded in 1990) but at least we had Teddy! Or did we? In the light of day, Teddy was a boon companion, a joy to play with, a best friend. But there was a side to this bear that wasn’t so pleasant–when the batteries got low the toy exhibited a tendency to turn itself on at any time and emit terrible noises the Worlds of Wonder engineers had fashioned by recording the death throes of poisoned crows. The children, an entire generation of sweet innocents, didn’t know that the toy’s designers had meant it to be a “fun” way of telling them it was time to replace the batteries. All they knew was that they would wake up in the middle of the dark night to see their beloved Teddy’s eyes furiously snapping open and shut like castanets while his mouth emitted cacophonous shrieks. They would scream, wet the bed, faint and basically be scarred for life. A supposedly new and improved version called Furby was released about ten years later, but anyone who has ever heard even one syllable of the Furbish tongue knows that these hairy plastic vermin were no “improvement,” but an even more insidious agent of devilment targeting our little ones. It is no wonder the Millennials are are every bit as maladjusted as Generation X.